If you have tried hiring household staff you will certainly agree that it is not such a simple undertaking. When hiring a receptionist for your office, you can call your agency with a specific list of skills that you are looking for in that person—good phone manners, a pleasant demeanor, good computer skills, etc. The same cannot be said when hiring domestic staff, a far more complex process due to a number of factors. Employers do not always have a strict definition of what they want in an employee, and find it difficult to communicate their requirements. Do they need a house manager or a butler, or should they hire a nanny or a governess? In addition, there is a visible change in attitude and perception about working in the household service industry. The traditional perception has been that household work is a menial job that no educated person would want to pursue. This is no longer true, for the most part; many college graduates are choosing careers in domestic service. For example, it is not unusual these days to have nannies with BA’s, Masters, or even PhD’s. Even executives and attorneys are leaving behind enviable corporate jobs to seek household positions in big estates where they get better salaries, more perks, and rub shoulders with the rich and famous. With this in mind, employers need to know how to interact with this new breed of workers, how much to pay them, and how to ensure the best fit for their households or offices. “Nowadays filling a position calls for breaking away from the traditional roles that have been attached to many domestic positions,” comments Mary Anne Sales, director of reservations of Celebrities Staffing Services, a bi-coastal agency with offices in New York and Beverly Hills. Indeed, domestic roles are changing fast. Today’s butlers are no longer simply the gentleman’s gentleman who perform a restricted number of tasks and do not get their hands dirty. Now they are equally skilled polishing silver, changing a light bulb, doing extensive research online, or giving massages to their employers. Similarly, the nanny in her traditional caregiver role may fall short for some families that are looking for someone who not only cares for the children, but is able to cook dinner, toss some clothes in the laundry, do the grocery shopping, and even walk the family dog. These are all issues that agencies across the country have to deal with on a daily basis with their clientele. Carefully evaluating a client’s specific needs leads to a successful hire. This process requires the agencies to ask the right questions of the hiring employer. “We ask clients very precise and detailed questions to enable us to match suitable candidates that will fit the employer’s specific demands,” notes Sales of Celebrities Staffing Services. It comes down to identifying the dynamics of the home, the likes and dislikes of the employers and knowing about their expectations. Even when working with a roster of candidates that is the crème de la crème, there is no guarantee that the placement will work because there are so many variables to the formula. A&E Johnson Agency of New York (with a second office in New England and another opening soon in London) was established more than a century ago, and has always subjected their applicants to extensive pre-screening. These days, only candidates with at least two years’ experience make it into their applicant pool. At the end of the day “chemistry is always important,” says David Crimmins, manager of A&E Johnson, and is what determines the outcome of the placement—assuming the candidate meets all other criteria. These new “21st century” household professionals are constantly improving their skills to stay at the top of their game in a very competitive market. Scudere’s PDSI academy offers a wide-ranging curriculum where students get the essential “book learning” they need in addition to the practical “hands-on” training provided in the institute’s 18-room working estate. When all is said and done, employers are looking for one thing, and that is trustworthy employees with a heart to serve, who understand them and their unique needs. Servants were essential to the functioning of middle- and upper-class homes in Victorian England. The nobility as well as the aristocratic class had to employ a whole army of servants to afford themselves the type of leisurely lives they were accustomed to. With few labor-saving appliances everything had to be done by hand. The working conditions of the servants were incredibly hard—many of them worked 16-hour days non-stop and receieved meager wages. Typically, servants were allowed only one day off per month at the discretion of their employers. Nevertheless they were conditioned from a very early age to accept their lot since they knew no other way of life. Additonally, many began service at a very young age; it was not unusual for girls as young as 12 or 13 to find jobs as servants in the big homes. Most domestic servants came from a rural background because they were considered more manageable and harder-working than the city servants. For most of the young girls who worked in these big mansions, life away from their homes was very different and very difficult. They were unfamiliar with the splendor of the surroundings and unused to the responsibilities they had to handle. Often, they did not even know the names of the common kitchen utensils and pieces of furniture that they were expected to clean. They had to learn everything the hard way. In the manor houses, large crews of workers operated within an unchallenged hierarchy; senior staff included the butler who ran the household, the housekeeper who was second in command, and the chef. 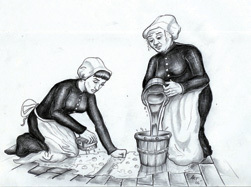 The lower ranks included the nannies that tended to the children and the maids who were responsible for cleaning. All staff (with the exception of gardeners) wore a uniform. This might be a simple black dress with white apron and hat for a maid, or a morning suit for a butler. There were many rules for the servants to follow both in the servant quarters and “above stairs” in the main house. They could not speak in the presence of their employers unless they were spoken to; they could not even say “good morning” or “good night” to their employers unless they were responding to them. When encountering one of their employers in the house, servants were expected to “give room” by making themselves as invisible as possible, turning themselves toward the wall and averting their eyes. One of the most common and difficult obstacles for servants to overcome was the lonliness and isolation. Their social life was restricted to a few fellow servants and to a couple of delivery men who came to the house on a regular basis. In spite of everything, most servants took pride in their work and provided efficient and skillful service to their employers. Once upon a time, there was an “upstairs-downstairs” approach to running private residences where rules were implied, but never written down. Today, as more estates and large residences begin to be managed more like small companies, the same rules of conduct that apply in the business community must also be followed by employees and employers of residences. Though each household is run differently, there are some common do’s and don’ts that, if followed, will allow for the smooth operation of an estate and rewarding relationships between staff and employer. “It’s up to the estate manager to make sure the house runs like clockwork,” says Craig Haigins, who was an estate manager for a U.S. Ambassador for twenty years. “It’s all about what the owner wants and any lack of coordination that prevents that from happening can create a chaotic household.” There are no best practices in the running of a private residence but as more households operate like a small company there comes a greater need to follow human resource practices used in the business world. Guy Maddalone, CEO of GTM, a payroll, tax and human resource services company, suggests to owners that they create a written household handbook that clearly sets the rules of the house, including what’s permitted and what’s not, use of property, time off, annual reviews, discipline, and more. Having it in writing prevents problems from occurring that can jeopardize the employee/employer relationship and lead to an employee quitting, being terminated, or even legal action by either party. DO maintain integrity and professionalism. According to Haigins, owners are looking for employees with clean records who are honest and reliable. He notes that even a small indiscretion in one’s past can prevent a person from being hired, especially if found later during background checks. It’s important that new hires understand what lines cannot be crossed and what house rules must be followed, such as not going through personal papers or computer files, following what’s asked, respecting privacy, maintaining dress codes and not abusing privileges, such as phone and internet use, or meal and break times. It is also important that owners respect their staff members and let them do the job for which they were hired. Employers who micro-manage or second-guess everything their staff does are looking for trouble. Following the golden rule never hurts. Communication between staff and employers and between members of the staff is crucial for household bliss. Paul Canzano, Director of Residences for a wealthy family in New York, stresses that respect and communication are the most important items to make a household run smoothly. “No matter what position,” he says, “housekeeper, butler, or estate manager, everyone must respect each other.” He makes sure that everyone who works under him understands that they’re all members of a team, even himself, and must work together. Canzano says problems occur when staff members bicker between each other and don’t communicate with the estate manager, major domo, or house manager or employer when a manager does not exist. Complaints usually have to deal with overtime, extra job responsibilities, working on holidays, and demands that go beyond what was laid out to them when hired, such as nannys being asked to do housework. DON’T forget to get along. The greatest challenge in creating a well-run residence is matching up personalities and styles between staff and owners. Employers look for potential staff members who fit into the dynamics of the family. For instance, if a family has pets staff members who like animals will most likely work out best. An industry term is “Service Heart,” which is the ability to suppress personal ego, while maintaining a low profile that never detracts from the owner. Sometimes it can be difficult for employees to keep their mouths shut, especially when they’ve gone beyond the call of duty, but it is their job to give credit to the owner or to keep quiet. “It’s a joy of serving families,” one estate manager stated who asked to remain anonymous. On the other hand, an employer should always be aware of the hard work and loyalty that their staff maintains every day. Small gestures, like hand-written “thank you” notes can go a long way to keeping a household happy. It was easy within a traditional, stuffy residential environment for service staff to maintain a strict professional demeanor and not become too “chummy” with their employers. With today’s families wanting a more casual atmosphere within their homes it becomes harder for staff members to maintain proper professionalism while keeping up the guise of a casual relationship with family members. Canzano says employees should have pleasant personalities but never go beyond the “good mornings.” He says, “As manager I tell the principals to never let employees get so comfortable that they ask special requests, like extra time off. It opens up a Pandora’s box.” Canzano advises his staff to “leave their personal lives at the door and pick them up when they leave—negative people don’t last long in this business,” he states. On the opposite side, employers should always remember that even though they may place a lot of trust with their staff, such as the care of children, that what they have isn’t a friendship but an intimate working relationship that needs to remain professional. It is a wise owner who doesn’t reveal personal problems to their staff, especially squabbles between family members that can put a staff member in an awkward position. DO maintain discretion and respect. All estate managers claim discretion is the most important rule of the house. Employees must realize that what goes on in the home stays in the home and that today’s families are all the more concerned about information being leaked to media sources, especially those with very public images, such as actors, politicians, and high-profile business leaders. Many employers have staff members sign confidentiality agreements that include privacy policies that make clear the consequences when rules are broken. Appearances and communicating clearly to those outside the family is also quite important. Workers who do not take down phone messages properly or give out wrong information can cause problems for family members. The smooth running of the household must always be the primary goal of every staff member. On the other side, employers must remember to treat employees with respect. For instance, an employer cannot expect a live-in household employee to sleep on a sofa in the living room or work without a break or some off time. Every estate or residence will have its own dynamics dictated by the owners’ wishes but if these do’s and don’ts are followed it will be easy to create a positive and productive atmosphere for both employer and employee. It’s simple: By following the rules it will be easy to create wonderful working relationships that will last for many, many years.